foppe's acre originals: New edition to Foppe's Matryoshka collection! 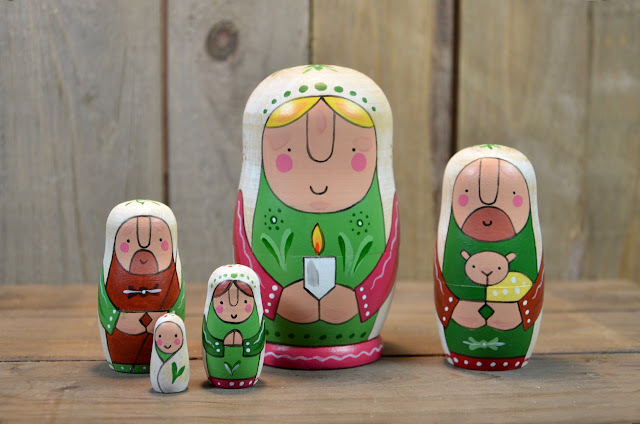 My Matryoshka Nativity nesting dolls have been a favorite of Foppe's fans for many years and light up many rooms all around the world at Christmas. Now there is a new version alongside the existing blue dolls with closed eyes; Bright eyed Nativity scene in festive Christmas colors! I don't know which ones I love best, I think they are all my favorite! Now available to cheer up your home for Christmas in my shop on Etsy. (If you'd like to order outside Etsy please send me a private message and we'll figure something out).